Last updated: August 17, 2018. We highly recommend that you go through the FAQ, as it may answer some questions you didnt know you had – all info in here is current as of the last update, and we try to keep this page as up-to-date as possible. What will I see in the Andamans? How do I get to your dive centers? For starters, you need to fly to Port Blair. Then you need to take a ferry to Havelock or Neil. Up to date information on this can be found in our Trip Planning page. How do I sign up for a course or for diving? Simple – email us on info@diveindia.com or use the Contact Us page, and tell us when you are coming. We will block a spot for you and send you an email with deposit information, how to pay and cancellation policy. When can we start a course? Pretty much whenever you want. We have Open Water courses starting every 1-3 days. If you are short on time, email us and we’ll arrange to have a course starting for you as soon as you arrive – even if it means a private course (and there is no extra charge for that). Just as simple – email us on info@diveindia.com or use the Contact Us page, and tell us when you are coming and what sort of room you want. We do suggest checking out the accommodation links at the top of this page for more info on our resorts in Havelock and Neil. We will follow up with you on the next steps, including how to pay the deposit. Once your booking is made, we will send you the details on how to pay the deposit via email. As King Leonidas said, then we dive in the wet. Rain doesn’t affect diving too much – especially the Intro to Scuba programs and the Open Water courses. It also has very little effect on visibility: rain only affects the surface, not what’s going on deep – we’ve had 30m vis while it has been pouring, and 5-6m vis during bright, clear days. What do I need as a pre-requisite, in order to be able to dive? Not a whole lot – you need to be in reasonably decent shape (able to walk 10-15 min without fatigue). You also need to know basic swimming (able to swim 200m). You also have to answer a Medical Questionnaire – if you answer “no” to the questions in it, you are all set to go. If you answer “yes” to any of them, you need to get a doctor’s clearance first on this document. Havelock or Neil - where should I stay? Well, for starters, the two islands are very close to each other, so geographically, the reefs are very similar. In terms of sites, most sites of Havelock are also accessible from Neil and also have some unique sites which are exclusive to Neil. However, we have done a lot more exploring off Havelock, whereas we are still discovering new sites in Neil. Neil, however, is very different from Havelock – Havelock is starting to get “developed” (relatively speaking), with higher tourist volumes and a little more in terms of other activities. Neil, on the other hand, is still pristine Andamans – a small, pretty island with open fields and traditional houses set in tree thickets, with very limited blatant commercial development. So it is a matter of picking your preference. The last factor is that our resort in Neil has more expensive rooms, so your accommodation budget/preferences may also lead you to choose one site over another. For now, the best option for certified divers would be to start in Havelock and then add a couple of nights at the end in Neil. For student divers, you can pick whichever location you want, based on whether you want a more lively island or a more pristine/mellow place – you get the same quality of instruction either way. What time are the ferries to/from Havelock or Neil? Info on ferry timings can be found on our Trip Planning page. Do I need to spend any nights in Port Blair? Please check our Trip Planning page for information on ferry timings. In general, if you land about 1 hour before the last ferry, you should be able to make it to Havelock on the same day. And if there is a ferry atleast 4 hours before your flight, that means you can head back to Port Blair on the same day as your flight. The Trip Planning page also has links to some places to stay in Port Blair. This is by no means exhaustive, so if you find something else that is more convenient, by all means book that. Can I get tickets for the 1130 or 1400 ferry to Havelock on the spot prior to departure? Sometimes, yes. Sometimes, no. Of late, mostly no. A lot depends on how busy things are. In peak season (October – May), it is virtually impossible to get these tickets on the spot. As such, we recommend our Meet’n’Greet service, where we arrange your ferry tickets and also all Port Blair and Havelock transfers. It will save you a lot of potential hassles, as Port Blair is not a place where you want to spend your limited vacation time. The exception to this is the catamaran, Makruzz. Tickets for this are available on sale from their website, so you can book this directly if you want (we can still arrange your land-based transports, in that case). Where else in the Andamans can I dive? At present, we do not offer diving anywhere else in the Andamans other than Havelock & Neil. We used to run special dive safaris to the North Andamans, but they are temporarily on hold as we re-visit the itineraries. Please follow our Facebook group for upcoming announcements on this. Can you book our Port Blair hotel for us? Unfortunately no. We used to do this as a service for our guests, but sometimes, the hotels in Port Blair lost the bookings. Other times, guests didn’t show up for the booking or opted for a cheaper room elsewhere. Yet other times there have been disputes regarding rates, service, etc. In all such cases, we were the ones who ended up looking bad. As a result, we have stopped booking these hotels. If you are here, we can provide you with the names and numbers of the hotels, as well as a phone, and you can book it directly. Our Trip Planning page has some recommendations on places to stay in Port Blair as well as phone numbers. When is a good time to come visit? as well: as good, if not better, than peak season diving with massive schools of fish and a lot of action on the reefs. The catch is that it does rain during this time, so top-side weather can vary and we may limited in our choice of dive sites. If you care just about diving, give it a shot though! May is another good time to come – usually, we start getting showers at this time, but the water is at its warmest and manta sightings are quite good at this time. June-August is usually rainy season and while we can dive, we cannot always go to our remote sites – however, over the past 4-5 years, June has consistently had relatively calm seas, and has offered really good diving – and we have usually very attractive stay+diving packages for that time, so this is a good way to get in some world-class diving for a relatively lower price. FOR BEGINNER DIVERS: The sites that we visit as part of the Intro to Scuba program and the Open Water course are accessible all year long, regardless of weather. Visibility is affected more by phase of the moon and tides, and so is variable all year long. As such, conditions for these programs are pretty consistent all year, and you can come whenever convenient. Do note that over the past few years, as weather patterns become increasingly erratic, the gap between “peak season” and “off-peak season” (June-August) is becoming increasingly blurred. Is it worth coming in June / July / August? If you are a beginner and want to do an intro dive or Open Water course – the answer is “YES – DEFINITELY”. The conditions at this time are not too different from in-season (not surprising, if you consider that tidal flow has the biggest effect on visibility here, more than surface conditions like wind and rain), and we have sites that are accessible all year long, no matter what the conditions. For certified divers, it is harder to say. During this period, we get regularly alternating patches of calm vs windy conditions – that, more than rain, affects our ability to go to our remote, highlight sites. Unfortunately, we cannot predict when it will be calm and when it will be rough – but going by the past few years, odds are good that the first few weeks of June are going to have good diving conditions. After that, a matter of luck. But as mentioned earlier, we are able to go to nearer dive sites, so this is a good time to come and get some experience and build your skills – this is the only time of the year when we discount our training, including Specialties, and small groups mean a lot of 1-on-1 time. Yes, there is the possibility of rain but don’t forget one other element: Havelock is really magical during the monsoons. You have the islands to yourself, the “tourism buzz” is over and it goes back to being a sleepy little island tucked away in a remote corner of the world. That is an experience that few other places can match, and that alone can make taking the risk of bad weather worthwhile. Well, that and the above-mentioned off-season discounts. Weren't you guys a SSI Platinum Center? What happened? Is my SSI card useless? Yes, we were a SSI Platinum Instructor Development Center dive center. 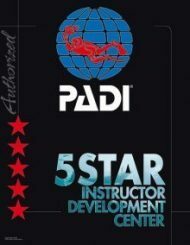 No, we are no longer teaching SSI, having become an exclusively PADI center. It has nothing to do with the customer side of things: we still believe in all the things we said about instructors mattering far more than the logo on the card. Our shift was precipitated by the organizational difficulties with handling 2 different agencies across 5 locations (translation: Vinnie’s feeble mind was being overloaded by all that stress). Your SSI card is still valid and if you need any assistance with it, do let us know and we will help you out. We take cash, Visa and Mastercard – there is a 2% surcharge for payments made in the Andamans with a credit card. Do note that for some reasons, debit cards do not work reliably, so a credit card is preferable. You can also pay via bank transfer if you have an Indian bank account. Is the cat really that grouchy? Oh yes. Take our word for it. Stick to the dogs – they are much nicer. We generally prefer communicating by email for a bunch of reasons. Information quoted on the phone can be misinterpreted, misheard or forgotten – emails remove the fuzziness and reduce the risk of such issues. We understand that you may prefer to ask your diving-related questions on the phone or make last-minute changes to your logistics over the phone as well: that is fine, please free to call the numbers in our Contact Us section. However, do note that the phones are answered by our dive professionals – who are not necessarily up-to-date on rates and availability. Any price or availability information you get from them is indicative, and not binding. Also, while we are happy to answer any questions you may have, we may be out diving, so we request that you read the website in detail – the information here is kept current and prices you will be quoted are exactly the same as published here (we don’t have any phone discounts). So this may actually save you time. Also, as mentioned earlier, we don’t take bookings on the phone and usually are not able to to give you availability information on the phone either (unless you catch us when we are on the computer), so you will most likely have to email anyway. Yes, we know this is highly unusual, but Vinnie has a thing about trying to do things in the most efficient/reliable manner even if it means doing things in an unusual way (and once something catches in his tiny brain, it is impossible to dislodge it), so this is how we operate. Seems to work ok, though, so that is something.